Patrickswell Brownes: F I R E ! F I R E ! Many excellent books and websites describe the fire and its aftermath. It is not the intention to detail that information here, but, only to identify how the Brown family was directly affected by the fire. In order to understand what happened to them, some specific information pertaining to the family and events is helpful. night, October 7 in “The Red Flash” area10 and was by far the largest to hit Chicago before the “great” fire of the next day. The fire started in the Lull and Holmes Planing Mill at 209 S. Canal Street near Van Buren. The fire had gotten a good start before it was reported and quickly spread to nearby homes and businesses in front of a “brisk wind.” More alarms were sounded. Thousands of onlookers gathered to watch the event, congregating in nearby streets and on rooftops. 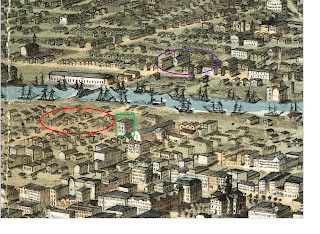 “The roof of a shed at Clinton and Jackson Streets collapsed under the weight of about a hundred and fifty spectators . . .”11 This was exactly the location where Johanna Roach was living and could have been at the same property, or very near. Before the fire was under control at 3:30 A.M. the next day, Sunday, every working fire engine in the city was at the scene, and the fire had consumed a four block area bounded by Adams Street to the north, Van Buren Street on the south, Clinton Street on the west and the river on the east, the area shown in the orange square on the map. The Roach lodgings were consumed in this fire. Logically, the Roach family would have gone to the house of Johanna’s mother at Jackson and Franklin to get away from the fire. David Brown also states this in his letter on page six when giving information about Johanna Brown Roach. He says, “. . . Johanna Roach was sick at this time. Her home was burned out, apparently and they took her to the home of her Mother. . .”12 Little did they know what was to come. The men were exhausted from fighting the Saturday fire and equipment had sustained major damage; some was destroyed. Fires don’t respect the frailties of man, or machine. Fire started again around 8:30 in the evening of Sunday, October 8, this time in the barn of the O’Leary family on De Koven Street between Clinton and Jefferson Streets in the southern part of the West District, about ten blocks south of the Saturday night fire. There was supposedly an alarm sounded about 9:15 by a fire company further south on Blue Island Avenue; however, no alarm was received by the central office until 9:40. Further delay was caused by the watchman in the courthouse tower who dismissed a possible sighting of the fire as the reflection of the embers from the Saturday night fire.13 As additional alarms came in, the firefighters were sent to erroneous addresses. Needless to say, the fire was raging by the time the tired men could really respond to the fire. The fire kept gaining strength devouring building after building as it marched in front of a now very strong wind from the south west blowing everything towards the city. After three hours, it had traveled seven blocks and was near the burned out area of the Saturday night fire. Most hoped that the previously burned area and the width of the South Branch of the river would halt the progression of the fire. That was not to be. Hannah Brown and the rest of the family survived the immediate dangers of the fire. 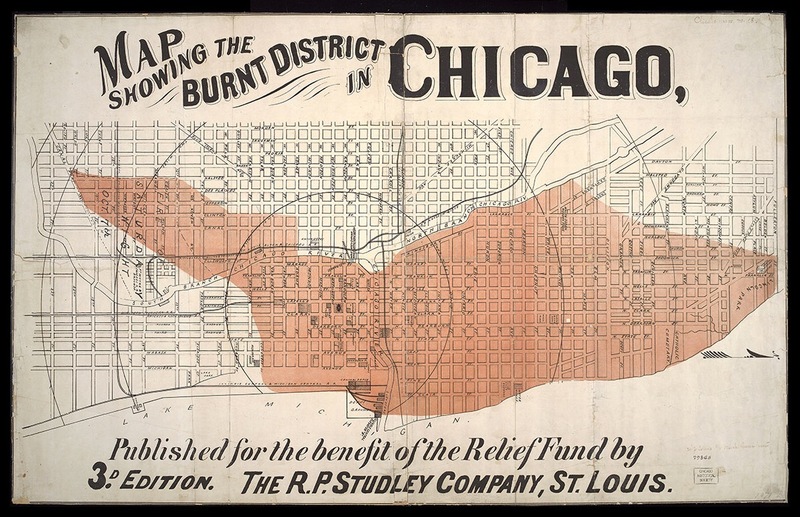 In talking to another Chicago researcher, people felt the effects of the fire for many years after. It continued to claim the lives of immediate survivors because of smoke inhalation and other illnesses and injuries received as a result of exposure to the fire. In the next post, we will follow Hannah in the aftermath of the fire. Fassett, S.M., Lincoln lying in state, Library of Congress, available online at: http://www.loc.gov/pictures/resource/cph.3a14020/. Photograph is of the funeral processing of Abraham Lincoln entering the Cook County Courthouse in 1865. 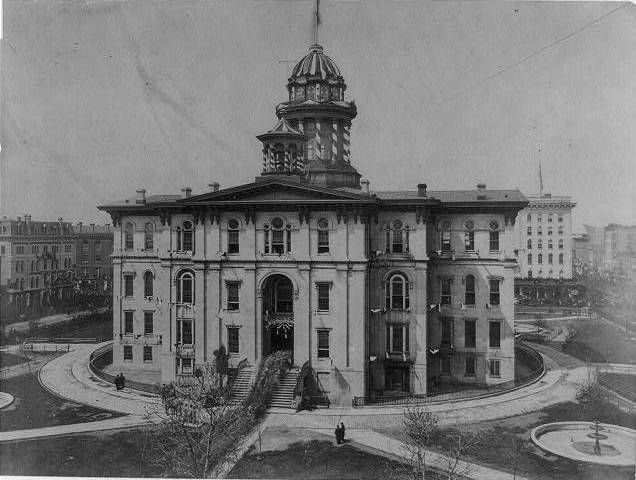 By 1870 three story additions had been added to both the east and the west side of the courthouse. All was destroyed in the fire of October 8, 1871. In 1858, Alexander Hesler shot eleven photographs from the roof of the Cook County Courthouse and give an excellent idea of what the city looked like at that time. The photographs have been “stitched” together to present a panoramic view. A link is available here: http://www.greatchicagofire.org/view-pano/1113/?v=1113 . Place your cursor in the center of the picture and move it right or left to see the complete 360o view as if you were standing on top of the courthouse yourself. 3. 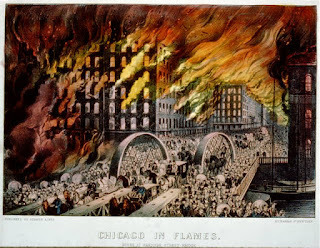 Chicago Historical Society and Northwestern University, website of The Great Chicago Fire & The Web of Memory, available online at https://www.greatchicagofire.org/great-conflagration/eve-of-disaster/. When activated, an alarm was sent an alert to a central office in the courthouse. It was then relayed to the appropriate fire station located near the fire. There was also a watchman stationed in the courthouse tower who had a view of most of the city. 4. Contemporary city directories show the address of 219 Jackson at the intersection of Jackson and Franklin. Odd numbers are on the south side of the street. 5. The Chicago River defines the area of Chicago. Before 1900, the North Branch of the river (flowing south), and the South Branch of the river (flowing north), met to form the Chicago River (Main Stem) which flowed into Lake Michigan. Anything north of the Chicago River and east of the North Branch was identified as North Chicago; south of the Chicago River and east of the South Branch was identified as South Chicago; west of the North and South branches was identified as the West Division. The central business district was located in the South District just south of the Chicago River and east of the South Branch. Note that about 1900, the river was “engineered” to reverse the flow of the Main Stem and South Branch of the river. See https://en.wikipedia.org/wiki/Chicago_River for an explanation. 6. Chicago Census Report; and Statistical Review, embracing a Complete Directory of the City, showing the Number of Persons in Each Family. Available online at the Newberry Library, http://chicagoancestors.org/downloads/1871%20intro%20page.pdf. The 1871 Chicago City Directory lists several Brown families, (Ellen, Honora, James, Michael, and Thomas), totaling eleven individuals. Two other families were also listed at this address – Anderson totaling seven persons, and Cheevers totaling five persons. 8. Charles Shober & Co., Guide Map of Chicago, Charles Shober & Co., Chicago, 1868, website of The University of Chicago Library. Available online at: http://pi.lib.uchicago.edu/1001/cat/bib/1595338. 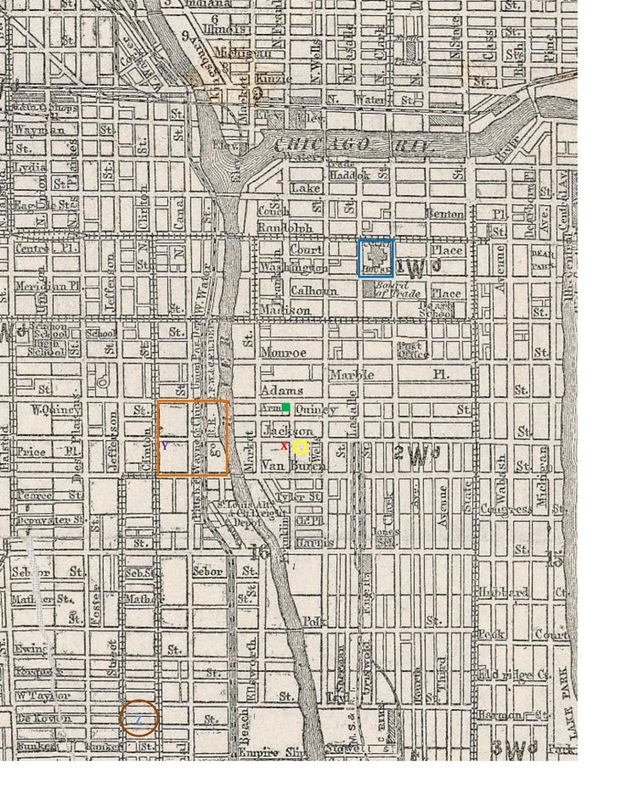 The map shown is an enlargement of a section of the Guide Map of Chicago. I have identified several places key to the Brown family. The blue box in the upper portion of the map identifies the courthouse where the watchman was located in the tower. The small green box in the center of the map is the location of the Armory. 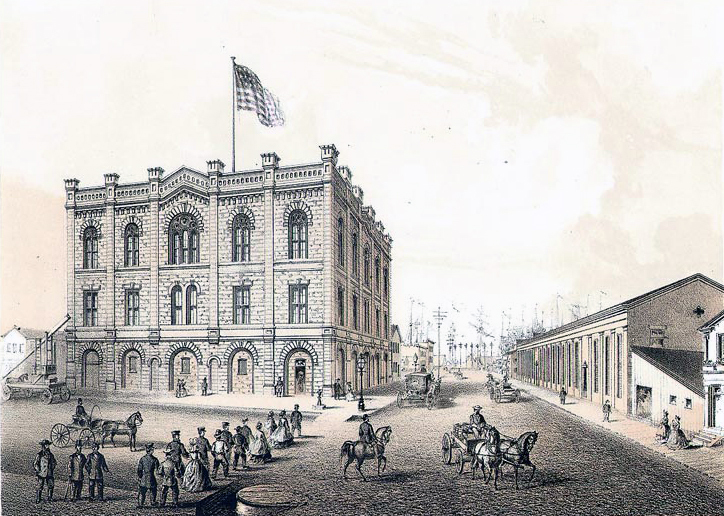 The yellow box on the south east corner of Jackson and Franklin is the site of the newly finished Parmelee Omnibus Company which was scheduled to open on Wednesday, October 11. The red X shows the location of Hannah Brown’s residence. The purple Y is where Johanna Roach was living. The large orange box identifies the extent of the Saturday night fire and the darker orange circle with a “Z” inside (ground zero) shows the location where the Sunday night fire started – the O’Leary’s barn on DeKoven Street. 9. 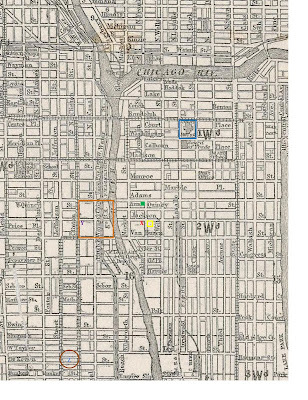 Ruger, A., Map of Chicago in 1868 from Schiller Street north side to 12th Street south side, Chicago Lithographing Co., available online at the Library of Congress, https://www.loc.giv/item/73693350/ . The image is an enlargement of a very small segment of the map. 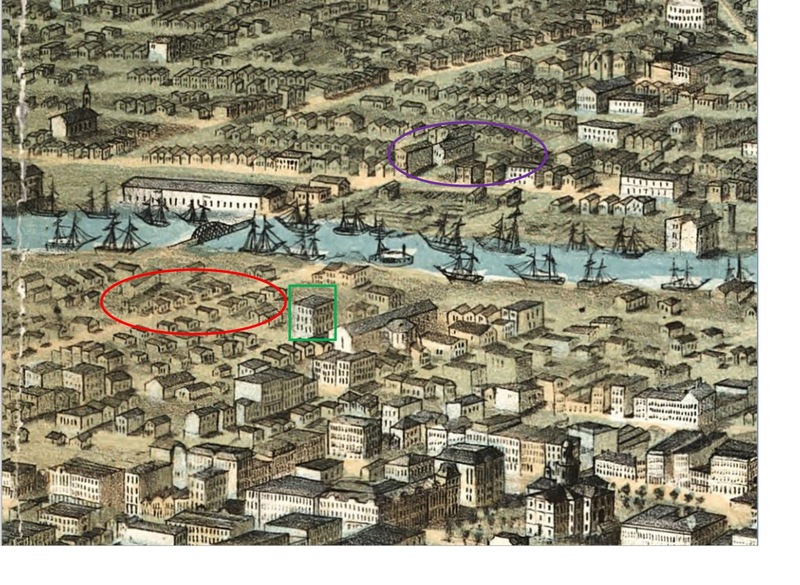 While it is oriented differently, the same notations apply – The red oval shows where Hannah Brown was living; the purple oval shows where Johanna Roach was living; and, the green square shows the location of the Armory. 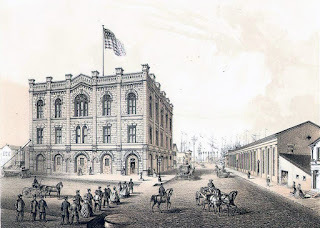 The Courthouse is the large building in the lower right corner of the image. 11. Cromie, op. cit., p. 25. 12. Brown, David Earl, Kewanee, IL, 11 May 1943, Letter to Esther ______, Columbus, OH. P. 6. The letter written in 1943 contains detailed information about the Brown family as known by the author at that time. 13. Check the map. The Saturday night fire, identified by the orange box, is directly in the line of sight from the Courthouse Tower to the fire on De Koven Street. 14. Cromie, op. cit., p. 63. 15. Brown, op. cit., p.3. Sarah Taylor is the granddaughter of Hannah and Timothy Brown. She is a daughter of Patrick Brown, the eldest son of Hannah and Timothy. Currier & Ives, Chicago in flames: Scene at Randolph Street Bridge, New York 1872-1874, Library of Congress. Image available online at: http://www.loc.gov/pictures/resource/cph.3a00324/ . R.P. 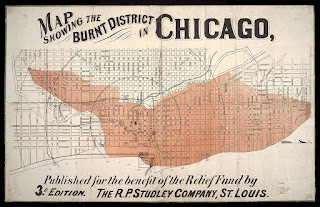 Studley Co. Map showing the burnt district in Chicago: published for the benefit of the Relief Fund . [Saint Louis: R. P. Studley, 187-?] Map. Retrieved from the Library of Congress, https://www.loc.gov/item/2010592712/. Thank-you Mary Ann. What an startling account of the fire and the immediate effect on our family. You helped this come alive for me. I just cannot imagine what a horrific event it was for them. I wish I had known my great grandfather, George and been able to know what his memories of the fire would have been. I never heard my grandmother, his daughter talk about any of this. I wonder why? Perhaps George did not talk about it to her. He was only about 6 at the time of the fire. It is always amazing to me what a strong and resilient family this is. We come from "good" stock! This is really an amazing account -- footnotes and all!